Talk to your bank about financing a car. Talking to a professional should be your first step. Being experienced with clients who have been in the same position, they can work with you to analyze your past statements and finalize a budget. You will want to know exactly what term you are able to afford, with the appropriate interest rate and how much you can fork over for the down payment. This step is crucial because in theory, as long as you are making money, you can afford any car with a loan. However, the amount you are making and/or able to pay forward will dictate just how long the term will be. In this sense, the longer the set term, the smaller the payment amount. However, the smaller the payments, the longer you are paying interest on the loan. A five year loan payment vs. a three year loan payment could be the difference of $200. This is something to strongly consider. Buying too expensive of a car may not take priority over other expenses you have to pay, no matter how long the term or how small the monthly payments. This leads me to my next point. The price of the car isn’t the only cost you will have. Lest you forget you have to afford the interest, car insurance, gas and maintenance on the car to keep it running smoothly for the entirety of your ownership. When considering the cost of the car all of these factors must be remembered. Choosing a car in your price range is crucial and this price range should be determined keeping these other equally as important factors in mind. Just because all of your friend’s parents bought their kid a 3-series BMW, does not mean you can afford one yourself. Car payments and loans have two parts: interest and principal. The principal is the amount you need to pay off the car or the balance. The interest is the additional cost of borrowing money. The APR is the rates, fees and other costs that come with the loan in the form of an annual percentage rate. My rule of thumb is three years; if it takes you longer you can’t afford the car. When you want a loan you basically have two choices: dealership loans or bank loans. You will almost always pay additional interest if you go through a dealership. The dealer will get the loan through a bank, so they are just a middleman. That is why I suggest going straight to the source. When you go see a lender, he will be assessing your credit score and credit history in order to make sure you will be able to pay off the loan. Essentially, the lender will be analyzing and predicting your future cash flows and budgets. If you have bad credit, you will likely pay higher interest rates or you may even be denied a loan. If a bad credit score is your reality, you will likely have to put a generous down payment on the car. The ability to pay a percentage upfront demonstrates to the bank that you are financially responsible which could help to lower your payments. When you are approved for a loan, the bank hands you a check to pay for the car and you will soon owe the bank a payment each month. Your new car will become what is called ‘collateral.’ In case you can no longer afford the monthly payments, the bank can seize your car to recover the money that is owed. Having the bank take your car will not only leave you riding a bike to work, but it will destroy your credit score, which will strongly decrease the likelihood of you ever being able to borrow money again. I know this sounds serious, but being a financially responsible adult is serious business. Read consumer reports. In order to minimize these external expenses, you may want to consider a car that is more reliable in terms of average breakdowns or miles to the gallon. Legitimate consumer reports could help you save significantly. As long as looking at the resale value of certain cars. Consider the pros and cons to buying a new vs. a used car. New cars have lower interest rates, but lose intrinsic value almost as soon as you drive the car off the lot. When the back tires hit the road, you have already lost up to a few grand. Buying a used car may mean that you can afford the quality brand you trust and essentially get more for your money. Buying new from a dealership usually means you have to pay for a salesman commission on top of the price of the car. Be a savvy negotiator. The marketplace is still a marketplace, and therefore the concept of sales will apply. Many times salespeople have more leeway in terms of prices than they initially give off. These bottom line prices tend to be far below the advertised price of the car. This is important to keep in mind if you find yourself feeling pressured by a sales employee to buy a specific car. In actuality, you could put pressure on the salesman and turn things around, by negotiating and trying to get the lowest price available. Lastly, make sure you take care of resale value, change the oil, rotate the tires, don’t drive recklessly, put a protective coat of wax on your car, and change the air filters regularly to keep mpg high. This will also save you a lot of money. So if you are buying a car, enjoy your new whip but be smart with your money at the same time! It will all pay off down the road, literally and figuratively. Businesses, like people come in all shapes and sizes. From big corporations, partnerships to sole proprietorships and LLC’s. These companies can range from businesses like Apple or Google to your sisters haircutting service or the local popcorn salesman on Main Street. You are a business, every day you make financial decisions and transactions with your finances to better yourself. You are constantly mirroring the acts of businesses all around you. Therefore, in order to be financially successful in your life you should always be thinking and acting like a business would, except instead working for a product or service, you are in business for yourself and your product is a fulfilled life and financial security. Budgeting with a ‘business sense’ is one of the tools that will get you there. A budget can be created by using the information from 3 different statements that businesses use everyday. Like any business, you need to keep in touch with your accounting and finance department regularly in order to make smart life/financial decisions. This way you are aware of where your money is going and how you can make it work for you in order to get the best possible return. 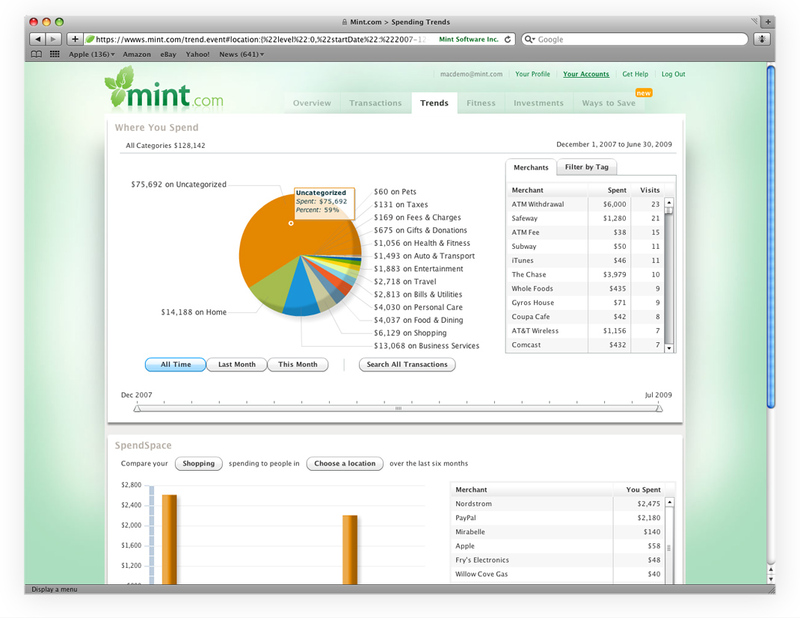 Using these statements or a financial tool like mint.com will help you keep track of your finances and how much you are spending and are going to spend on your “business”. This is the statement that shows you your income in relation to your expenses. This statement usually is a single column report with income at the top showing your personal revenue. It doesn’t matter if the money is coming in from your job or other alternative sources of income., this just shows your inflow. The expenses are your outflow. The report will give you your NOI (net operating income) which is basically your personal profit. This will let you know if you are spending too much money. This way you can tell if you need to stop shopping in SoHo on Saturdays or buying too much late night pizza on the Lower East Side at 4am. The balance sheet is your statement that tells you your net value at any given time. This statement breaks down your assets and your liabilities and what you physically own (equity). Here you will show your assets on the left column. These are things like your cash, money that people owe you, your car, house, value of your investments etc. The right side has your liabilities. 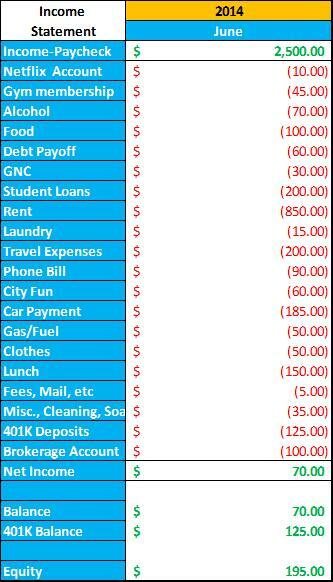 These are your debts, such as loans that you have yet to repay for a house or car, and/or your credit card debt. The left side is also where you put your equity. This is essentially your value or ‘net worth’. Your assets are going to equal your liabilities plus your equity. So the right side should equal the left. See below for a visual representation. 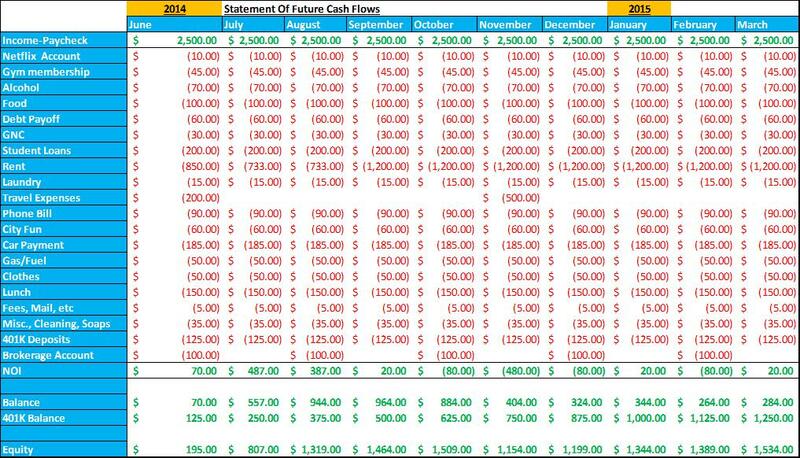 The statement of cash flows is important because this is where you are able to financially model where you will be at any given point in time. this future value is based on certain assumptions such as how much you predict you will be making and how much you will be spending at a future point. This shows on a scale of time your income minus expenses. It is usually a good idea to stay on the more conservative side because the future is never certain. So it’s good to not overestimate income and underestimate expenses. Using this statement is helpful because you can see where in the future you will be able to afford more expensive things like a new car or vacation. This will keep you prepared. Click on the visual to see how this works. Even if you’re personal versions of these statements are on the more basic level that is okay. You are still making progress and will be more financially informed about your money. These are just power-ups to bring your budget to the next level. I would recommend updating them once a month, so you can always have an accurate sense of where you are. When finances are constantly on your mind you will be more self-aware when spending and save more money. During my time in college I took many finance and business classes in order to graduate. Some of them were helpful and some were just there for me to take, pass, and move on with my life. I will always remember the words of one of my finance professors on the first day of class. He asked the class what are the three fool proof ways to become wealthy. So I thought I would share my professor’s insights with you all because its always good to learn more about how to become wealthy. The first foolproof way to make money is by marrying into money or by inheriting money. We see often or hear about children with large trust funds and inheritances turning 18 and have sudden access to large amounts of money that was set aside for them or dictated by a will. We also see families acquiring wealth from deceased wealthy family members. The second way to be wealthy is to be extremely lucky. This includes winning the lottery, investing in a fairy tail stock (that brings you millions) or having a million dollar idea and executing a business perfectly. Now this does happen every once in a while but the chances seem pretty slim for the average person to find such luck. The first two ways seem like they carry a low probability for most of us and I would like to think people these days still get married because they love someone rather than trying to marry someones bank account. But….the third way we can become wealthy in our lifetime is to always remember one rule. If you always spend less than you make or spend less than you are able to afford you will surely be wealthy. This concept is so simple yet so many people in all parts of life have such a difficult time understanding that, in order to have money, we have to hold onto it and not spend it. This brings me to a good point. Millennials in our generation have a tendency to spend money like crazy whether its at the bar, on food, clothes, accessories, or phones etc. A lot of this stuff far surpasses our basic necessities. Most of the time we are not getting any kind of return on our money financially and a diminishing return on the thing that we buy. So if you plan on being wealthy or want to start, just remember one rule, spend less than you make. Stay tuned for the next article as we break this down more for better understanding…. Recently, while attempting to tackle a vast amount of credit card debt, I came across the much-needed concept of Budgeting. Budgeting is an unusual verb that is not often used in this generation, I too was a little lost. Especially after spending way too much last year on bars, food, beer, lunch, dating and anything else that drains your wallet. I felt like I hit rock bottom financially. I realized I had spent way too much money on too many perishable goods and services. This was a sign I needed to take better control of my financial habits soon or else this terrible pattern was bound to continue. Mint.com is a budgeting website and application that you can easily download onto your phone, laptop, or other smart devices for free! 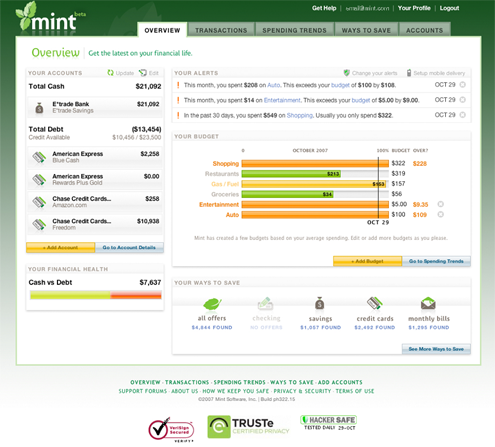 Mint.com provides personal budgeting tools that allow users (your futures selves) to add all of your financial accounts and display all of your balances simultaneously. This is done in a similar way to an instantaneous balance sheet showing your personal assets and liabilities. I was able to add all of my loans (school and car), bank accounts (checking and savings), credit cards, 401K, and even my brokerage account on Mint.com. At any given time you can view your exact net-worth down to the penny. With Mint.com I am able to see my balances and account activity anywhere I go. This application provides an accessible display of my spending habits in the form of helpful visualizations. The best part about this service is the categorization tool and the budget planning aspects. Within the site I am able to see all of the purchases that I make on my various credit cards and withdrawals from my accounts in real time. I also have the ability to put these purchases into specific categories to see where my money is going every month. Using these categories I am able to customize personal budget plans. I therefore am able to manage the amount of money I am going to spend on certain necessities such as alcohol, fast food, work lunch, breakfast etc. Mint.com service will even send my cell phone alerts when I am spending too much or have gone over my set budget. 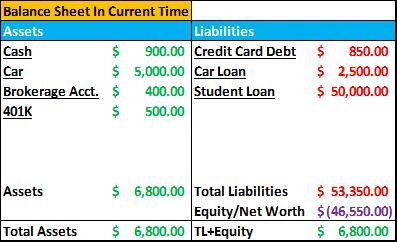 These budget limits also tell me if I am saving the appropriate amount so that I am able to pay my loans and credit card bills on time. This service helped me tremendously with my spending habits and keeping my debt under control. I highly recommend this service to anyone and everyone who wants to be proactive about their financial budgets! See Mint.com for more information and remember, knowledge is power when it comes to taking control of your finances. Below are some relevant screenshots of Mint.com.